“Oh cool” was my son’s reaction when he saw this… thing. What is this thing? 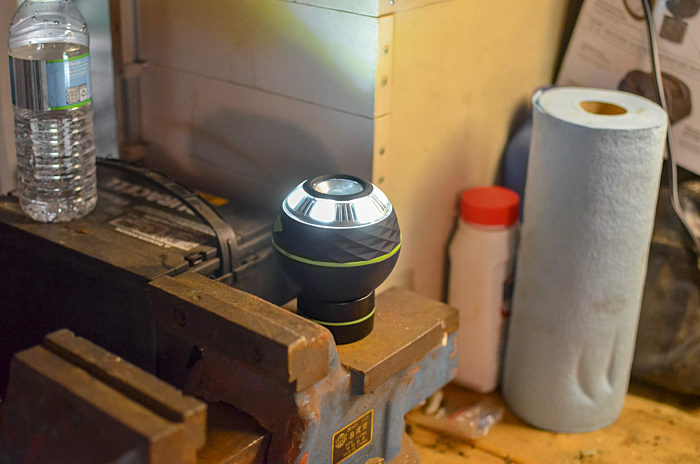 It’s called the Pod Light from Mychanic, a unique take on the work light that goes almost anywhere. The first thing I noticed: Batteries included! It also meant it wasn’t USB rechargeable, something I’ve been looking for in lights recently. Let’s take a look at that base. It’s magnetized on both the concave side (to hold the pod) and the flat side, for mounting on a metallic work surface. Feeding time! The Pod Light takes three AA batteries. There’s a single diamond-shaped button on the top of the softball-sized light. You get a low (6 surround LEDs) and a high (all LEDs) setting. There’s no setting for just the central LED. Here’s the Pod Light, mounted on a metal part under my hood. How long does the Pod Light stay lit? To try this, I installed a set of regular rechargeable Eneloop AA batteries and let it sit on the brightest setting. After a few hours, the LED intensity dropped. I’d say the listed 7 hours is pretty accurate. By the next morning, it was more like a dim night light. The Pod Light kept putting out a faint glow of light (not very useful) for nearly 36 hours before going completely dark. I’m not sure how alkaline AA batteries would fare, but the discharge curve is probably a little different. Mychanic states that “you won’t be able to put it down” and I think they’re right. The sphere shape just feels fun, and I ended up going around the house to see where I could stick the magnetic base (appliances, shelves, car door). I still wish the Pod Light was USB rechargeable, but at least they were good enough to include AA batteries. DELK, founded in 2001, is a small, fast-growing and privately held Consumer Product Company based in Nashville, TV. They design and distribute products across the U.S. and in over nine countries abroad. The company’s marquee automotive brands include MYCHANIC® and FrostGuard® - winner of QVC's 2014 Product Concept of the Year. but our hearts are in Nashville. Music City. It’s home to country music, hot chicken, and yes...DELK. There is no better music to our entrepreneurial hearts than the sound of innovation.